With a pretty sparkle and topped with a candy cane kiss, these fabulous red velvet cookies will be the star of your holiday events. 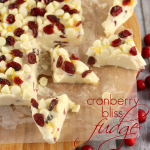 Perfect for holiday parties, cookie swaps, and even gifts for friends and neighbors. 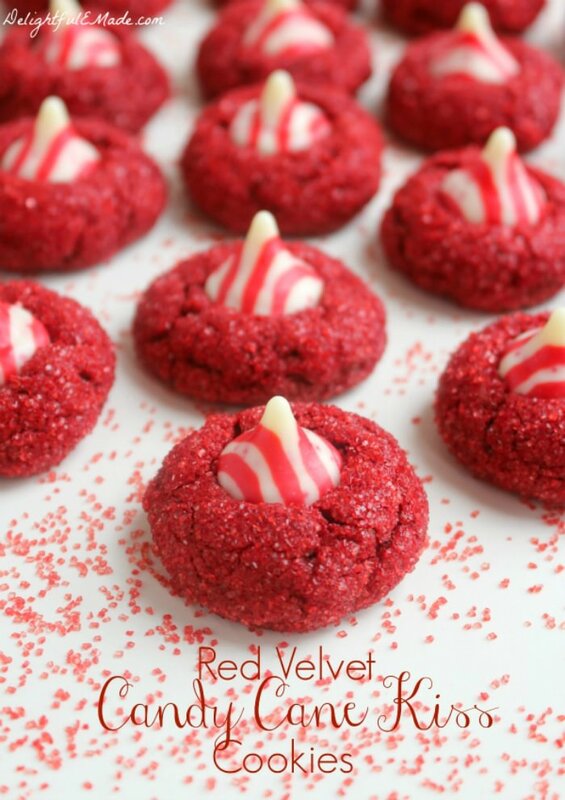 Looking for some pretty red velvet cookies? 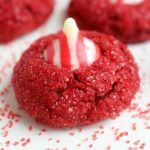 If you were thinking that this Christmas needs something new, then these sparkly, delicious Red Velvet Candy Cane Cookies are right up your alley! 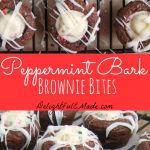 Made with delicious Hershey’s Candy Cane Kisses, these fun Christmas cookies are the perfect easy recipe for your next cookie exchange or Christmas party. 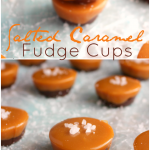 This year I was very excited to participate in the 4th Annual Great Food Blogger Cookie Swap. Hundreds of food bloggers bake up a fun, exciting holiday cookie recipe, and exchange it with three other participating food bloggers. I shipped out these Red Velvet Candy Cane Kiss Cookies and in return received three dozen other delicious cookies. 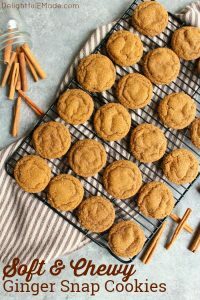 It was so much fun making these cookies, as they’re perfect for a cookie exchange just like this! 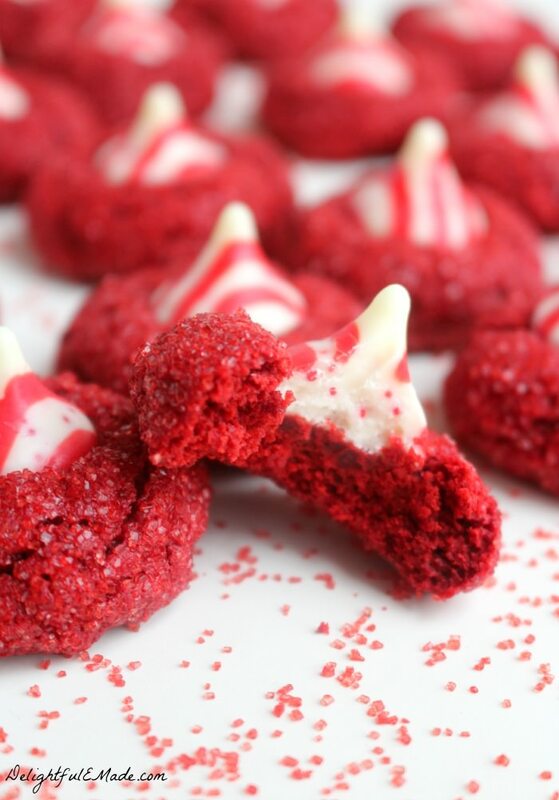 These Red Velvet Candy Cane Cookies start with a red velvet cake mix! 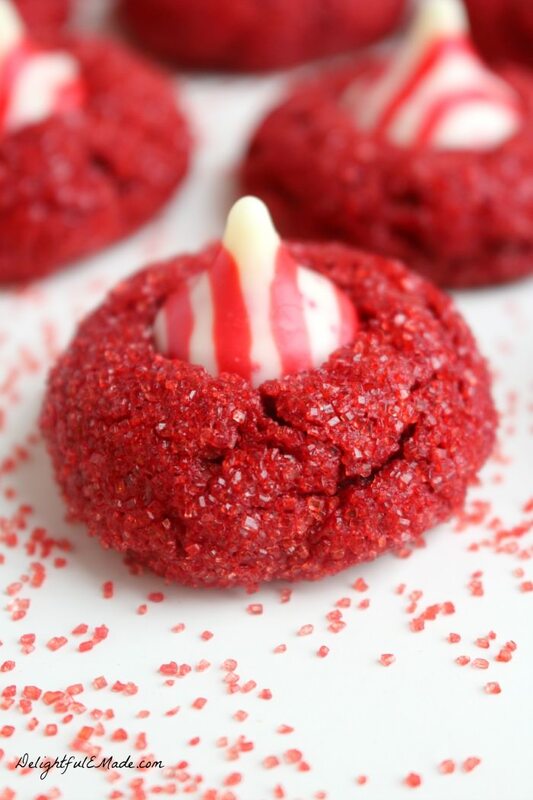 These Red Velvet cookies are really easy to make! 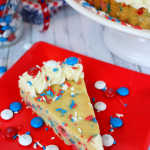 They start with a fool-proof Red Velvet cake mix, along with just a few other ingredients. 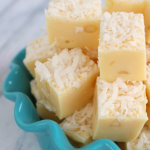 The batter is super moist, as it includes both butter and cream cheese! 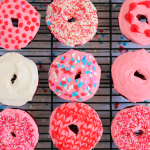 The dough is then rolled in red sugar sprinkles, and baked to perfection. These red velvet cookies come out of the oven with a beautiful sparkle. 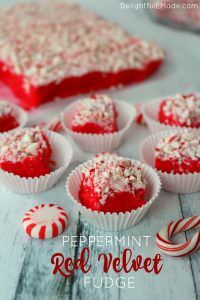 While still hot, simply add a pretty red and white striped Candy Cane Kiss, and let cool. Aren’t they lovely?! 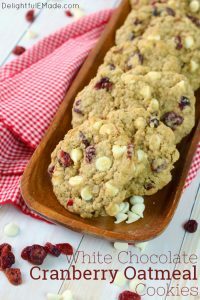 Red velvet cookies perfect for just about any occasion! 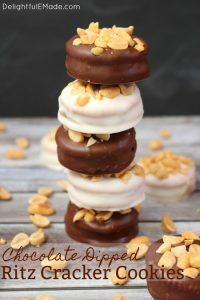 One batch of these cookies makes nearly 4 dozen cookies, so these are perfect for putting together cookie plates to give to friends and neighbors. They’re also great for shipping to loved ones that live far away, or keeping on hand for holiday parties, or office & school events. OXO Good Grips Medium Cookie Scoop (Amazon Link) – The key to getting uniform cookies that are all the same size is to use a cookie scoop. I’ve had this OXO cookie scoop for years, and it works great! Silicone Baking Mat – Set of 3 Half Sheet (Amazon Link) – One of my favorite baking tools are these silicone baking mats. 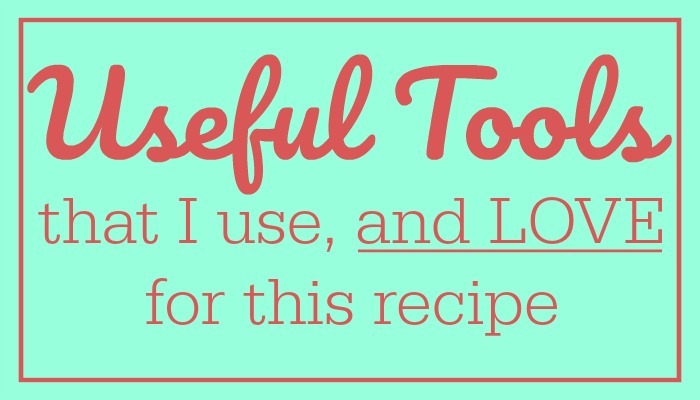 I use them pretty much anytime I’m baking something on a sheet pan. Fantastic for cookies, and also great for roasting vegetables, sheet pan meals and even tater tots! Nordic Ware Aluminum Half-Sheet Baking Pans (Amazon Link) – I’m currently obsessed with these baking sheets! Not only do they work wonderfully for cookies, but I love using them for sheet pan dinners, too! With a pretty sparkle and topped with a candy cane kiss, these fabulous holiday cookies will be the star of your holiday season. Preheat oven to 350 degrees. Line cookie sheets with a silcone making mat or parchment paper. Set aside. Using a stand or hand mixer, cream together the butter and cream cheese. Add the edd and extract and cream together until fully incorporated and a smooth consistency. Gradually add the cake mix approximately one cup at a time, stopping to scrape down the sides of the bowl. Batter will be thick. In a seperate medium bowl (like a cereal bowl) pour about half of the red sugar sprinkles. Roll batter into 1" balls, and then roll in the the dough balls in the red sugar sprinkles. 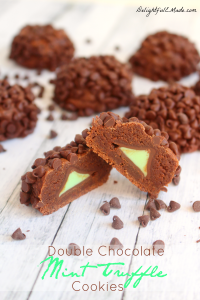 Place about 1 dozen cookie balls onto prepared cookie sheets and bake at 350 for 9-10 minutes. While cookies bake, unwrap the kisses, so they are ready to go when cookies come out of the oven. When cookies are done baking, immediately press a kiss into the center of the cookie, and let cookies cool on the sheet for 5 minutes. Transfer cookies to cooling rack to cool completely. Serve right away or store in airtight container at room temperature. Can also freeze cookies, and bring to room temperature prior to serving. I hope your holiday season is merry and bright! 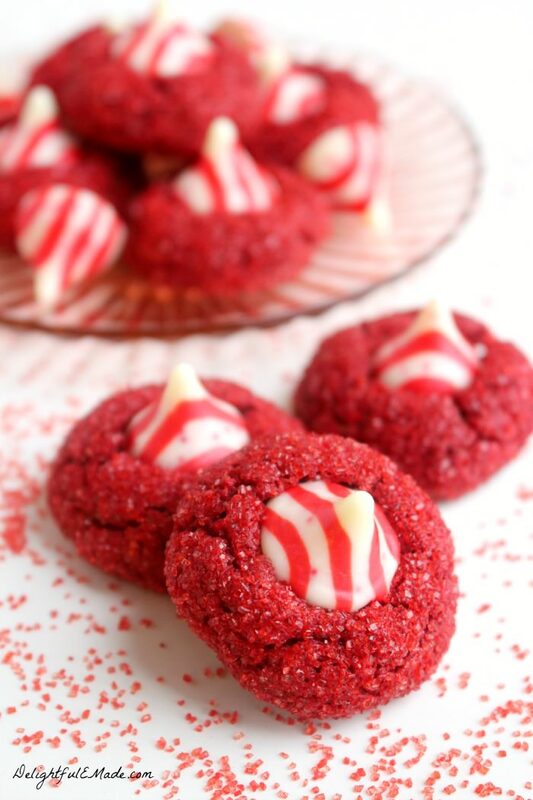 With a little help from these Red Velvet Candy Cane Kiss Cookies, it will be just that! From my family to yours, have a wonderful Holiday Season! 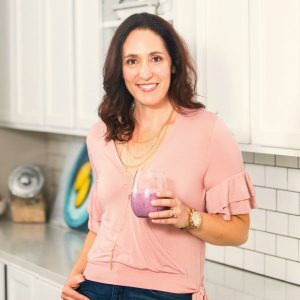 I like your site with the recipe's. Thank you. Wishing you A very Merry Christmas. What's up, after reading this awesome paragraph i am also glad to share my know-how here with friends. You never cease to crack me up; your sense of humor is as delicious as your coikoe recipe and these are fantastic coikoes! Good thing there's no limit on how many pins allowed on Pinterest!!! I'm so far behind, but I wanted to make sure I stopped by and thanked you for sharing at the What's for Dinner party. Hope to see you again this week!